Lovage (Levisticum officinale, Koch.) is a perennial herb, native of the Mediterranean region. The large, dark-green, shining radical leaves are usually divided into two or three segments. Toward the top the thick, hollow, erect stems divide to form opposite, whorled branches which bear umbels of yellow flowers, followed by highly aromatic, hollowed fruits (seeds) with three prominent ribs. Propagation is by division or by seeds not over three years old. In late sutumer when the seed ripens, it is sown and the seedlings transplanted either in the fall or as early in spring as possible to their permanent places. Rich, moist soil is needed. Root division is performed in early spring. With cultivation and alternation like that given to Angelica, the plants should last for several years. 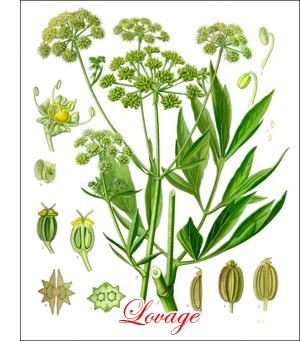 Formerly lovage was used for a great variety of purposes, but nowadays it is restricted almost wholly to confectionery, the young stems being handled like those of Angelica. So far as I have been able to learn, the leaf stalks and stem bases, which were formerly blanched like celery, are no longer used in this way.